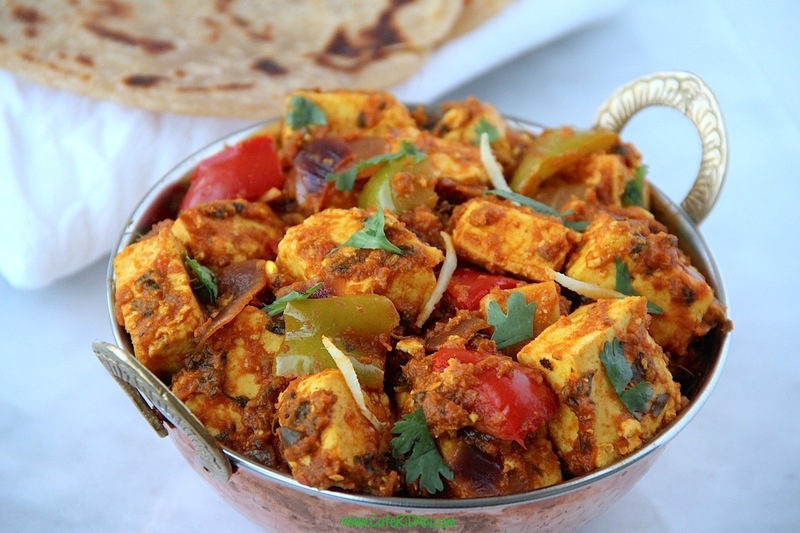 Kadai Paneer is a very popular Indian vegetarian cottage cheese dish. 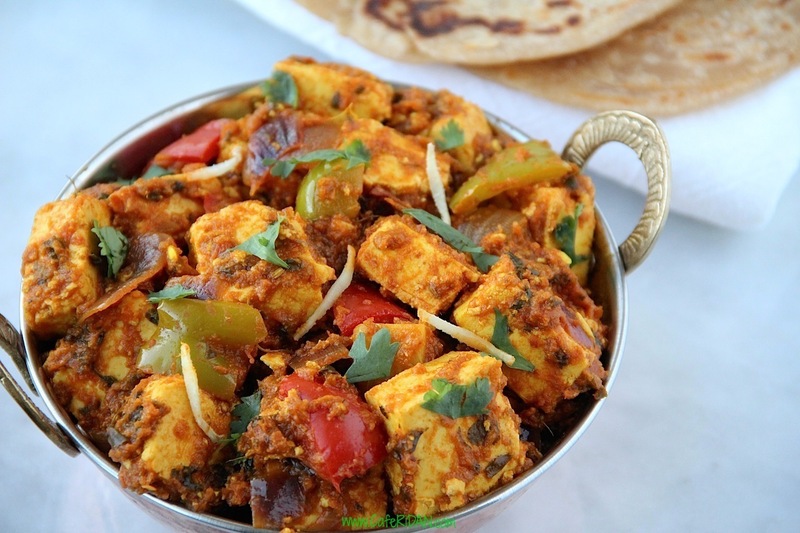 It is called kadai paneer because the paneer or cottage cheese is cooked in an Indian wok called kadai. If you do not have a kadai, you can use any wok or pan. 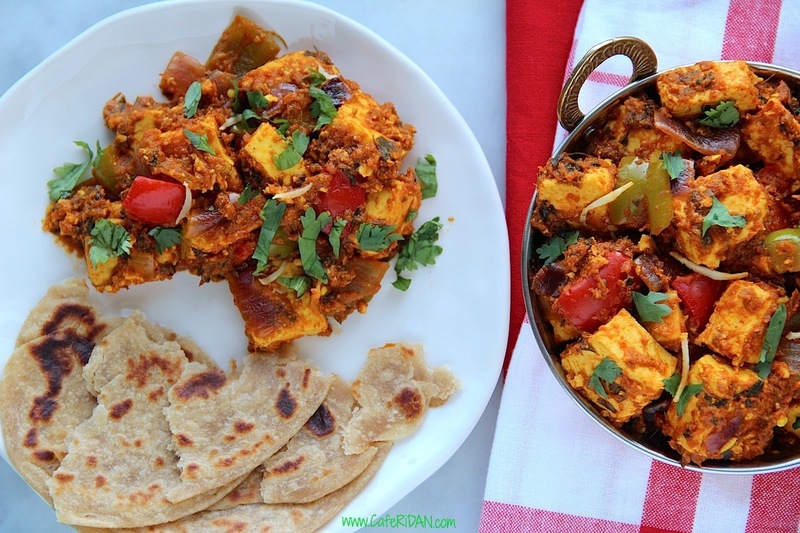 The paneer is cooked with onions, bell peppers, tomatoes and ginger garlic. The main flavors of this dish come from the dry roasted ground spices. I have tried making this dish with pre ground spices and it just does not taste the same. When you freshly roast and grind the spices they add an amazing lemony, warm and spicy flavor to the dish. Paneer or Indian cottage cheese is a very versatile and popular vegetarian option. It cooks really fast and absorbs flavors very well. Store bought paneer is easily available at all Indian grocery stores. I like to soak the paneer in some warm water for a few minutes to make it soft and spongy. This dish tastes delicious served with hot rotis, naan or parathas. Cut the paneer into cubes and soak in warm water. In a dry sauté pan over medium heat, roast coriander seeds, cumin seeds, fennel seeds and whole dry red chili until lightly toasted and fragrant. This should take about 1-2 minutes. Let the spices cool slightly and then coarsely grind in a spice grinder or mortal pestle. Set aside. Grind the ginger, garlic and green chili into a paste and set aside. Heat a kadai or a large pan on medium heat. Add oil. Once the oil is hot add ginger, garlic and chili paste. Sauté for 2-3 minutes. Add tomato paste and tomato puree. Cook for about 10 minutes stirring occasionally. Add the dry roasted spice mixture and red chili powder. Sauté for a couple minutes. Add onion, red bell pepper and green bell pepper. Cook for 3 minutes. Add water and salt. Cook for another 5 minutes. Add the paneer, kasuri methi and cilantro. Mix well and cook for 5 minutes.